Realistic and very attractive arrangement of faux garlic is available here on Amazing Produce. 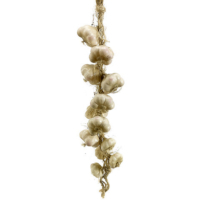 We offer a wide range of artificial garlic to help you decorate your kitchen corners. We make our faux garlic high quality polystyrene enveloped in a natural straw covering. If you want the visual addition of garlic without the smell in your kitchen, this is the way to achieve that. Most people believe that garlic originates from California, and they would have been correct a few years ago. The self-proclaimed “garlic capital of the world” Gilroy, California, used to be the largest supplier, but they’ve been outdone. In short, for any of your fake garlic needs you have, let us to help you in choosing the best garlic for your requirements. So, get on Amazing Produce today and grab your best deal for the artificial garlic.